I am looking for a "Yosemite Indian" expert. I am a third-generation Walker River Paiute from Schurz, Nevada, but my grandmother spent her first six-years in Yosemite Valley. I have family in June Lake, Mono Lake and even Mid-Pines. For my entire life, I have been told my maternal family is really from Yosemite even though the majority of my family is registered in Schurz. I am specifically looking for information on George Sam, his wife Lucy Sam, Emma Priest, Sarah Priest, Cypriano and any other immediate family relations. Starting from Captain Sam 100 percent, full blooded, Paiute. Born at Mono Lake, with his wife, Susie Sam, who was deceased and he verifies, with thumb print, under oath, that Susie was also a 4/4 full blooded Mono Lake Paiute. 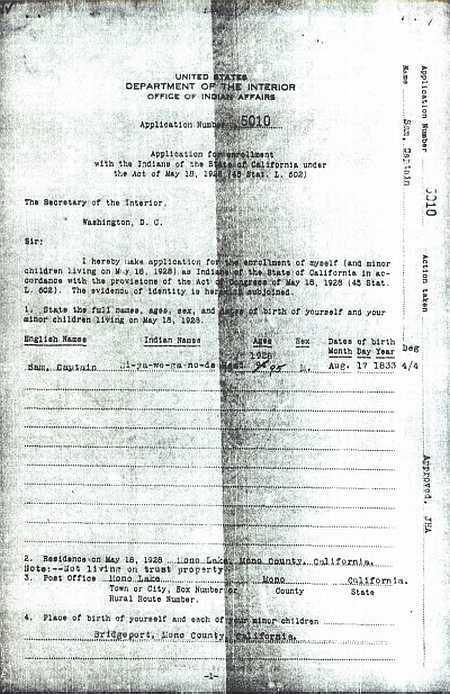 I didn't put up all the pages because it would be too many, but his daughter, sister of George Sam, helped Captain Sam fill his application out. Also the majority of the family said that Captain Sam and Suzie were both full blooded Yosemite-Mono Lake Paiutes and NOT Miwoks. Only a couple of people said that Suzie Sam was a Miwok or Digger to get a free house in Yosemite, the rest of the family said they were 4/4 Paiute. George tried to get a house in Yosemite and work there, but he was turned down because at the time he was single. No single men was allowed to live in Yosemite. So to live in Yosemite you had to claim to be Miwok or part Miwok. Captain Sam was a part of the Sam family around Yosemite-Mono Lake. He had a brother named Kosano Sam, who had a daughter named Maggie "Taboose" Howard, and Captain Sam had a sister named Lucy, not to be confused with Lucy Toney-Sam, wife of George Sam. They were from Yosemite, Brigdgeport and Mono Lake. Captain Sam's niece, Taboose, is very famous and you can see her photos everywhere in the Park and in books. Something Yosemite does not tell people. Miwoks were the scouts for the white militia, the Mariposa Battalion, and NOT original Indians of Yosemite. If you claim you are a Miwok....you are NOT an original Yosemite Indian, but from the workers of James Savage and the white miners. The Miwoks were the ones who helped find Tenaya and his band and were NOT part of Tenaya's band. They were afraid to enter Yosemite Valley. Miwoks worked withe whites BEFORE Yosemite was discovered. The Miwoks dug their gold as a work force. In search of riches James Savage and his Indian (Miwok) miners got to close to the mouth of the Yosemite Valley and the Paiutes came out and attacked Savage's trading post along the Merced River. Today the Southern Sierra Miwuks are claiming to be Tenaya's band and they are NOT a federally recognized tribe. Now I believe the Hogan family is from Sarah Priest. I don't have that right in front of me, but George married Lucy Toney, daughter of Charley and Mary Toney. George and Lucy had Clyde and Eva. Now Eva married Clancy Hogan and had a daughter. 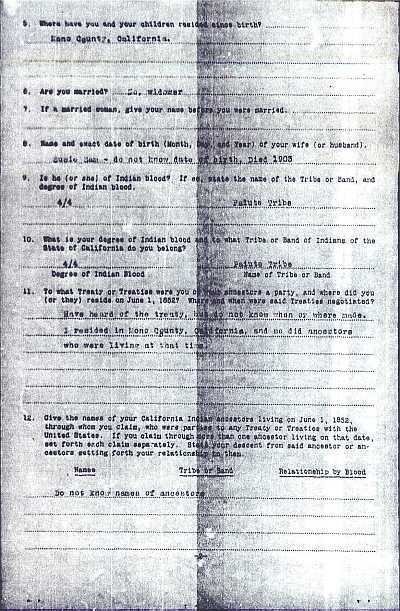 I believe by then the Hogans were mainly Tibo about 1/4 Indian. They were a large family. 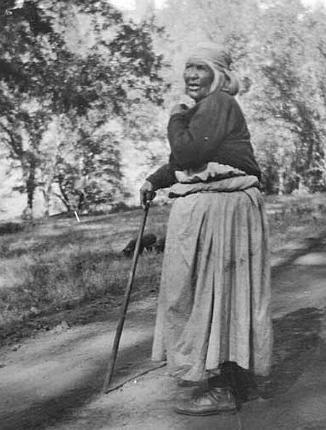 Sarah Priest was the daughter of Cypriano, an Awal or Walla Indian in the Mariposa/Tuolumne area. Cypriano signed the 1851 Fremont treaty. The Awals were "downriver people" and the Yosemites (Mono Paiutes) lived above in the Mountains. Cypriano wsa described as a tall man for an Indian. Cypriano was the enemy of Chief Tenaya and the Yosemite Indians. Cypriano was given a large piece of land in exchange for his assistant, but whites came and took it away because it had good timber on it. Which upset him considerably. You have the Wells, Cromwells, the children, grand children, the spouses of the Sam descendents, saying that the Sams were 4/4 Paiutes. I go with the majority, and what Captain Sam said, since he was the patriarch. If Captain Sam stated that he was from Mono Lake, why would some descendents claim he was from Fort Bidwell, which also had another Captain Sam? For the elders of the Southern Sierra Miwuk to say that Cap. Sam came from Fort Bidwell goes against ALL this families early documentation. I believe that the ethnologist at Yosemite NPS falsely instilled this into the elders mind so thus eradicating Paiute claim for Yosemite. Rightfully as Cap. Sam's descendent you might entertain the thought of approaching YNPS to voice your concern that the Park is ERASING Paiutes from the Park, which was our ancestral home. As a Sam and a Mono Paiute you are the rightful HEIR to Yosemite. At one time the Park claimed both Captain Sam and Suzie were Miwoks if that was the case descendents of Captain Sam would NOT qualify for membership of Schurz, Bishop and other Paiute tribes where the majority of their descendents are enrolled. Interestingly the Southern Sierra Miwuk group only recognizes Louisa and Leanna as the only two children of Captain and Suzie Sam. They never mention George Sam or Helen. You would think they would include the other siblings. If you want after you view this information and if you request to have me edit it out. I will do so. Remember you come from the earliest people of Yosemite...the Paiute people, strong, and feared by their enemies. Thank you so much for the information you supplied. But it only bred more questions about my ancestors. Was Sarah Priest the mother of Emma Priest? Who was Sarah's husband? Do you know anything about Lucy Sam's parents, the Toneys? Do you know any place where there is more information on the allotments that removed our families from yosemite? Sarah Priest at Midpines, California. She was also called Sallie Priest. Born 1848 to Cypriano, chief of the Awals. The information is online regarding Clarence, his brothers and the Hogans in the book by Bingaman called The Ahwahneechees. John Bingaman was a Yosemite Park ranger who was interested in the genealogy of the Indians working at the Park. Emma Priest remarried a tibo named Lee Lemaster, and had children with him also. Emma was married to a man named David Hogan first and had Henry, Clarence, and Roy. As you can see in the book that Clarence had a daughter named Margaret Acequero (Oceguera). I guess Bingaman didn’t know how to spell Oceguera. Born September 22, 1899, near Bear Valley, Mariposa County. His father was Dave Hogan, half white, his mother was Emma Priest, half white, of Mariposa. His wife Hazel, who was raised by John and Lucy Telles, died in 1944. They had a son and two daughters. Delbert, the son, died in 1944. Helen married a man by the name of Coats, and they had three children, Jack, Alveta, and Lisa. Henry worked for the Yosemite National Park sanitation crew for many years. They own a home near Whispering Pines, Mariposa County. His wife Hazel was born 1909, near Mono Lake, her last name unknown. John and Lucy Telles gave her their name. In 1944 she met a tragic death by some unknown assailants near San Francisco. Her body was severely battered and thrown out in the bushes in a lonely spot. No reason was found for their heinous crime. Born January 2, 1907, near Bear Valley, Mariposa County. He was the son of Dave Hogan, half white, his mother was Emma Priest, of Midpines. He married Phoebe Wilson Lovine, in 1931. They lived in Yosemite Indian Village. Clarence, worked for the Park, on road and trail crews. He was unfortunate and became addicted to liquor, and under its influence he was quarrelsome. In one of these spells he fought with his family and wife, doing bodily injury to his wife. He was cited before the U.S. Commissioner and given a suspended sentence if he would give up "fire water" and cause no more trouble. He left the Park after this trouble and made his home in Mariposa. He had a daughter from an early marriage, her name is Mrs. Margaret Acequero[Oceguera], and she now has a large family and lives near Gabbs, Nevada. Clarence died, July 22, 1965, and was buried in the Hern Cemetery, near Mariposa, California. Born October 2, 1904, near Mariposa, California. A son of Dave Hogan. He married Louise Valenzuela, and they had one daughter who now lives in Santa Clara. Roy worked in Yosemite for the road maintenance and lived in the Indian Village some time. He was killed when his car went out of control and turned over the grade near Mariposa, some twenty years ago. Josiah PRIEST, a native of the State of Maine, and aged about fifty-three years, died at his home on Bear Trap, near Colorado, in this county, Monday morning, April 28th. The deceased was a well known and respected citizen of Mariposa County, and came here from his native state in the year 1860 and settled near Colorado, where he has continuously resided ever since, and followed the occupation of a miner. He had for the past year been a severe sufferer from that fatal disease, dropsy, which finally caused his death, and on Tuesday April 28th, he was buried near his home. The funeral was largely attended by old friends and acquaintances of Sherlock's, Colorado and Mariposa. A wife and six children are left to mourn the irreparable loss of a kind and devoted husband and father. Funeral services will be held here tomorrow for Mrs. Sarah Priest, 92-year-old Colorado [Colorado was a district in Mariposa County] Indian woman who died at her home on Bear Creek last Tuesday morning. Mrs. Priest was born April 12, 1848, on Bear Creek and had spent her entire lifetime here. ** Sarah (or Sallie) Priest, daughter of Cypriano, was allotted and I believe some of her descendents, the Lemasters still live on that allotment. Cypriano’s area was BELOW Yosemite around the town of Midpines where Sarah Priest’s allotment is at. As a direct descendent you should be on heirship cards for the Sarah Priest allotted lands. If you are unaware of that contact the Sacramento BIA to request heirship cards under FOIA. You will have to show how you are related to Sarah Priest. Last edited by Yosemite_Indian on Mon Jul 04, 2011 6:39 pm, edited 2 times in total. Born near Blue Mound, Kansas, date unknown. His father was white. 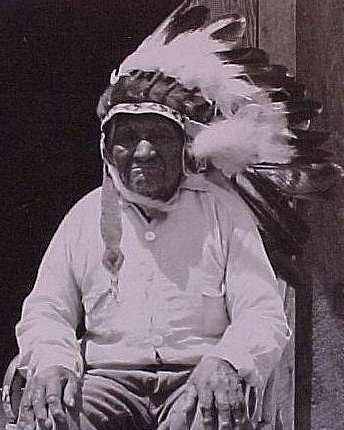 He married Emma Priest Hogan, of the Mariposa tribe. They had one son, Richard. Lee worked for Yosemite National Park on road maintenance for some time, in the early 1930’s. He died, January 17, 1951, and was buried in the Hern Cemetery, near Midpines, California. Born 1924. His father was Lee Lemaster. His mother was Emma Priest. He married Velda Johnson. They lived in Yosemite. They had three children: Donald, Gale, and Bonnie. Richard worked for the Park on labor crews for some years. He was killed in an auto accident near Oakhurst, California, April 1, 1951. I don't think the private message system works here. I sent a PM to you but it didn't record as sent only in the outbox. But I would like to share some personal information. If you can contact me thru my email. tahoejack@. . .
TahoeJack - Did you know the Chairman of Fallon Paiute/Shoshone tribe, Alvin Moyle, is a Mewuk/Mono Lake Paiute? There are many people who are descendents from the Yosemite-Mono Lake area living in Nevada on different reservations and colonies. I figured out the message system on here. I never used it before.